Q. How do I find a class? A. Go to www.hrfoodsafe.com/servsafe-class-schedule.php scroll down and select your state, then select a city that is close to you. Click on city and it will take you to the class registration form. Q. How do I register for class? A. Go to www.hrfoodsafe.com/servsafe-sign-up.php. Once you click submit on the registration form you will immediately receive and email with instructions for the class and payment. You will also land on the payment page to make payment if you are ready. Q. How much is the class? A. Standard rate is $145 plus $7.95 S&H for the book and includes the Live Class, Written Exam, ServSafe Book and access to our Online Study Portal. You can also add $20 and take the exam on a laptop at class for immediate results. Q. Do you offer group discounts? A. Yes! Email info@hrfoodsafe.com for details. Group rates as low as $85 per person! Q. Can I pay at the class? A. Payment locks in your seat and gives you access to our study portal the same day you pay and your book is mailed the next day or brought to class if it is within 3 days of the class date. Cannot guarantee a seat without payment or send study material. Q. Can I just take the exam without the class? A. Yes you can! You still need to complete the class registration form and under “Please Choose Your Course” select FPMC – Exam Only. The cost is $99 and you would arrive at a designated time for the exam only. Price does not include study materials. Q. Can I take the class online? A. Yes, but you would still need to come to a class location for the exam portion. You can get information and register at www.hrfoodsafe.com/servsafe-online-class-registration.php. Q. Do you offer Spanish classes? A. Yes we do! You can find our class schedule at www.hrfoodsafe.com/servsafe-sign-up.php. We also off the Spanish class online through our Study Portal as well as through ServSafe. In our Study Portal there is a full video series in both Spanish and English and a thorough presentation to do online training. We also have the Spanish ServSafe Book that is included with the live class. Once attendee completes the online training they attend our regularly scheduled English or Spanish classes and take exam. Q. What are the class hours? A. Class and exam time vary by location. Be sure to review the times on our class schedule. Most classes start at 8am. Pre-registration 745am-8am, class starts promptly at 8am and runs till noon. Exam is 12pm-2pm. We do a working lunch so bring a snack or lunch with you. Q. How long is the test? A. You have two hours for the exam. It is a 90 question multiple choice test and you need a 75% or better to pass. Q. What if I fail the exam? A. You can retest for $55 and are welcome to attend the full class again at no additional charge. Q. What is the difference between Food Protection Manager Certification and Food Handler? A. Food handler is for dishwashers, prep, cooks, servers, etc. FPMC is for all lead, supervisory and management positions. Also, some jurisdictions require ALL kitchen team members be FPMC. You should check with your local regulatory agency. Q. How do I get a copy of my certificate? A. If you attend an HRFoodSafe class you will be given very detailed written instructions on how to access your results and/or certificate. Please email info@hrfoodsafe.com if you are having trouble accessing. Be sure to include your legal name as well as class date and exam session number if available. If you did not attend one of our classes please visit www.ServSafe.com. Q. What if I cannot make it to class? A. All purchases are final and non-refundable. You can reschedule with no penalty at any time 7 days prior to class. If you do not notify us a minimum of 7 days prior to class you forfeit your payment. If you contact us in less that 7 days, there is a $55 reschedule fee. A no-show no-call is subject to a $95 reschedule fee. Purchase is transferable, can be used for anyone you choose. Q. Can my certification be used in all states? A. In nearly all states the ServSafe certification is reciprocal. Be aware though, some states may require more hours of training. Just be sure to let us know what state you will be working in so we can make accommodations. HRFoodSafe recommends taking the class to be sure all information is reviewed to help be successful in passing the exam but more importantly…keeping the food safe! We are available for private classes with 5 or more at no additional charge anywhere in New England and 10 or more anywhere outside of New England (US) at no additional charge. Please email info@hrfoodsafe.com for more details. A. In nearly all states the certification is reciprocal. Always check with your regulatory agency for specifics. Q. Who can take this course? A. Anyone who chooses to for personal development. Q. How long is the course and is there a time limit? A. The course is self-paced, you may leave and return as you wish. HRFoodSafe does limit the availability of the course for 30 days. Q. Does the exam have any restrictions? A. The NEHA course is competency based. Once you complete the course you are certified. The TAP course does require to be proctored at a Pearson Vue Testing Center. No notes may be used and is proctored to insure the integrity of the exam. Q. Is there a teacher available? A. No, it is a completely online course and interaction is limited. You are given access to PDF documents which you can print or save. Q. How long is the certificate good for? A. Certification is typically good for 5 years but you would always want to confirm with your regulatory agency. STILL HAVE QUESTIONS OR NEED MORE INFORMATION? Email info@hrfoodsafe.com with any questions. We will contact you shorlty via email. Feel free to call at any time 855.HR.Train (855-478-7246). Personalized Service, Integrity, and Commitment in all we do! ServSafe and ServSafe Alcohol are registered trademarks of the NRAEF, used under license by National Restaurant Solutions, LLC. 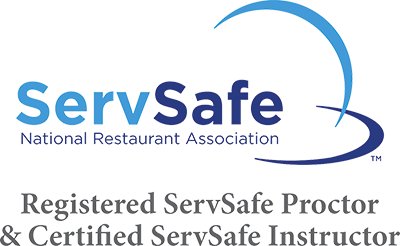 The logo appearing next to ServSafe is a trademark of the National Restaurant Association.